Claim Review : क्या वाकई एक बच्चे ने राहुल गाँधी को ‘मोदी-मोदी’ कह कर चिढ़ाया ? हमारे व्हाट्सएप्प ब्रॉडकास्ट से जुड़िये | आपको भेजना होगा अपना "नाम" और भाषा "अंग्रेजी" या "हिंदी"
A former city correspondent covering crime, Nivedita is a fact checker at BOOM and works to stop the spread of disinformation and misinformation. When not at work, she escapes into second-hand bookstores, looking for magic or a mystery. 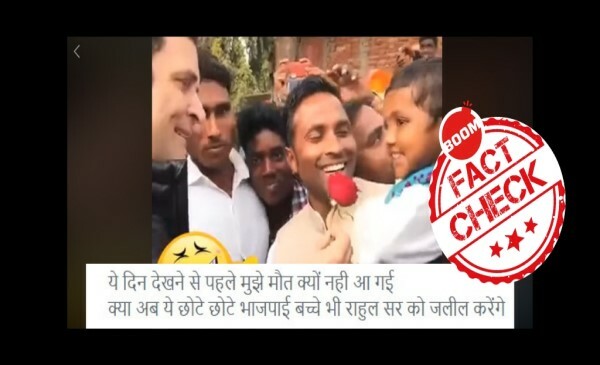 क्या भाजपा के टिकट पर लोकसभा 2019 का चुनाव लड़ेंगे बाहुबली स्टार प्रभास ?